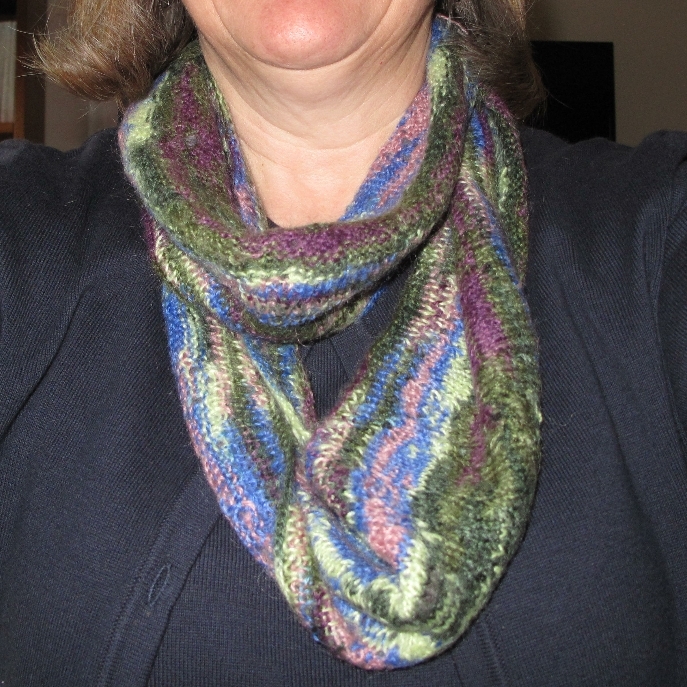 Several years ago, my mother made a lovely swirl scarf for me. The scarf was one that she made without using a written pattern. At the time, I asked her to describe the pattern. It’s fairly simple, just remember to relax to keep your yarn tension very loose. Using color A, cast on 100 stitches. Row 1: Knit across, keeping tension very loose. Row 2: Knit two in each stitch, keeping tension very loose (200 stitches). Row 3: Knit two in each stitch, keeping tension very loose (400 stitches). Row 4: Knit two in each stitch, keeping tension very loose (800 stitches). Row 5: Knit two in each stitch, keeping tension very loose (1600 stitches). Row 6: Attach color B and knit across (1600 stitches). Cast off all stitches. 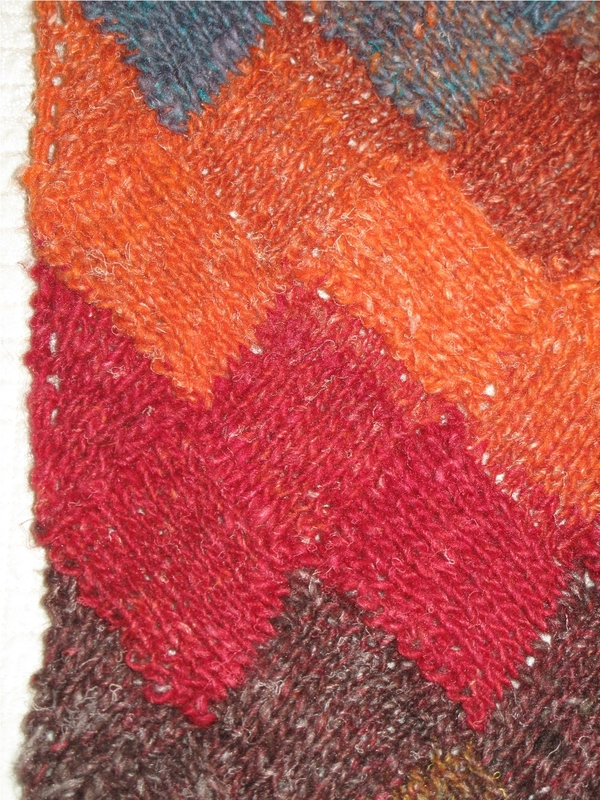 Edging: Attach color C with slip stitch. Sc in each stitch along edges of the scarf. Weave in all yarn ends. Yesterday, I decided to make a hat to match the scarf. The pattern I used was one I have had in my pattern collection for a while. However, I revised the pattern by removing two of the 5Shell rows in the white section of the pattern and completing the the final SC row with fur style yarn. Together with the scarf, it makes a nice set. A while ago, I had an idea for a knit infinity scarf. The lace pattern idea I thought would look nice. And, since I live in Minnesota, we have plenty of days when scarves are needed. 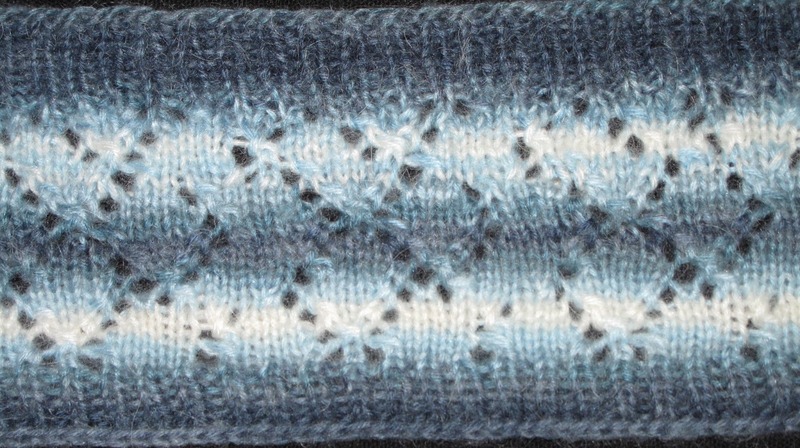 Cast on 560 stitches and knit 38 rows following the pattern below. Since I was using my own pattern, I wasn’t sure how the scarf would turn out. 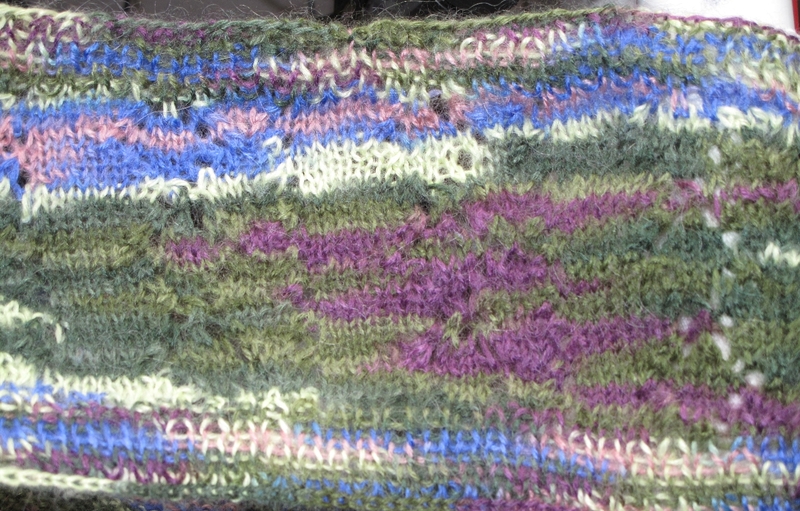 As I was finishing, the completed scarf appeared that it would measure 5″ x 100″. As I was binding off the stitches, I realized that this was too long for an infinity scarf. So, before binding off the entire scarf, I dropped some stitches in two areas to allow me to unravel a few sections. I then cut the unraveled sections into two pieces, 22″ and 72″. The longer piece was made into a scarf by tying knots at the edge of the knitting at each end. The ends of the shorter section were sewn together and lined with polar fleece to make a headband. On a recent trip to New York City, I decided to try this pattern again with another skein of yarn, but using fewer stitches to be able to create a true infinity scarf. 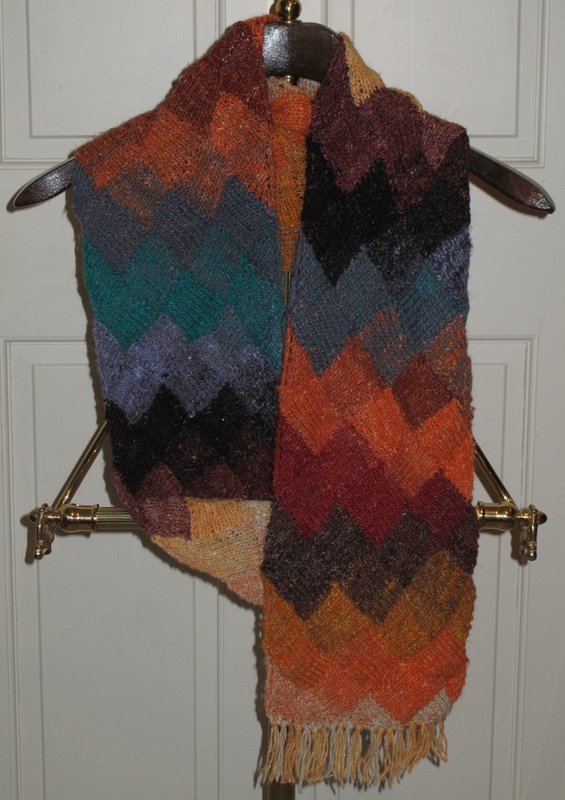 The completed scarf measured 5″ x 62″. Cast on 400 stitches and join for working in rounds. Make sure that the stitches do not twist when joining the first row. Rows 1-8. Work ribbing, K1, P1 across each row. Odd Rows 9 to 33. Knit across. Row 10. (K2, K2Tog, yo, K1, yo, SSK, K3, K2tog, yo, K4) repeat 25 times. Row 12. (K1, K2Tog, yo, K3, yo, SSK, K1, K2tog, yo, K5) repeat 25 times. Row 14. (K2Tog, yo, K5, yo, SSK, K1, K2tog, yo, K4) repeat 25 times. Row 16. (K1, K2Tog, yo, K3, yo, SSK, K1, K2tog, yo, K5) repeat 25 times. Row 18. (K2, K2Tog, yo, K1, yo, SSK, K3, K2tog, yo, K4) repeat 25 times. Row 20. (K3, yo, slip 1, K2Tog, psso, yo, K3, K2tog, yo, K5) repeat 25 times. Repeat Rows 9 -18, ending with an odd row (knit across). Rows 34-41. Work ribbing, K1, P1 across each row. It’s hard to see the lace pattern on this yarn. But the infinity scarf is lovely!